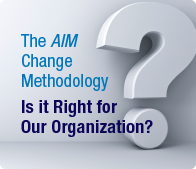 The AIM Change Methodology: Is it Right for Our Organization? Are you in the market for a change management methodology? How do you go about knowing which is the right option for your organization?